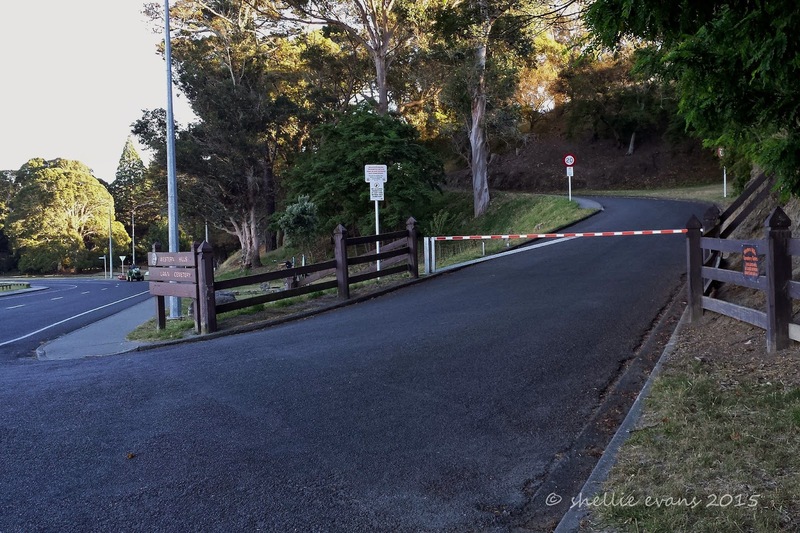 For one of my morning walks while in Napier, I drove to Park Island (which is in fact now known as Western Hills but will forever be Park Island to me). Park Island was for many years the HB Hospital Board farm on the outskirts of Napier city. Dad managed the farm for over 20 years and my whole childhood (except for the first 2 years) was spent living and growing up on the farm. The farm had a Jersey dairy herd & pigsty of around 400 pigs. The Jersey cream was sold, the skim milk fed the pigs & supplemented the food waste that came from both the Napier & Hastings hospitals. Park Island Farm was surrounded by two large farms; the Harbour Board Farm & the Lagoon Farm. Before the 1931 Napier Earthquake most of this land lay 2 metres under seawater and waves lapped the base of Park Island. 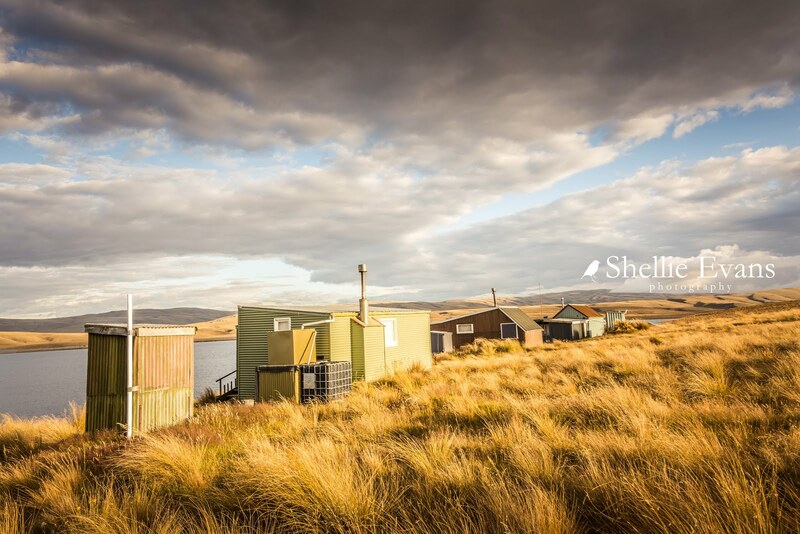 During the quake thousands of acres of land were lifted out of the sea and this reclaimed land became these two farms. 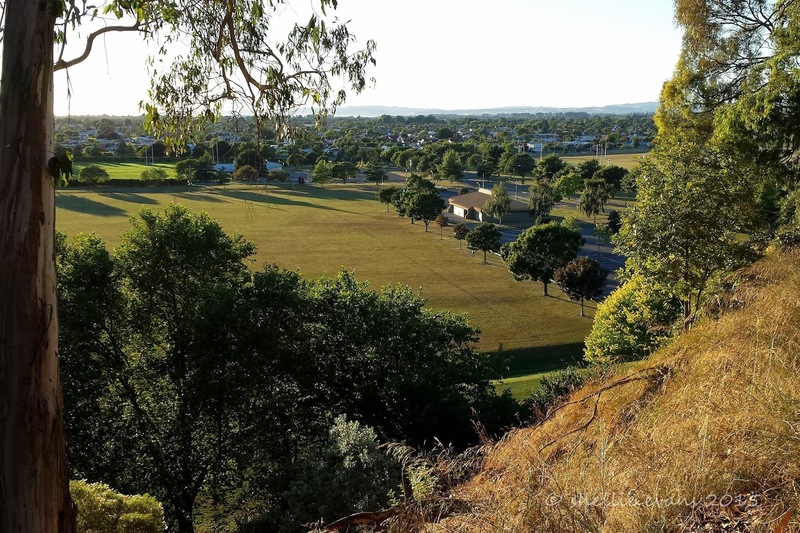 Eventually the Harbour Board Farm and part of the Lagoon farm were taken over by Napier City Council to become the suburb of Tamatea and to supply sports fields for the growing city. The Hospital Board Farm (Park Island) was also acquired and became the new cemetery for Napier called Western Hills. 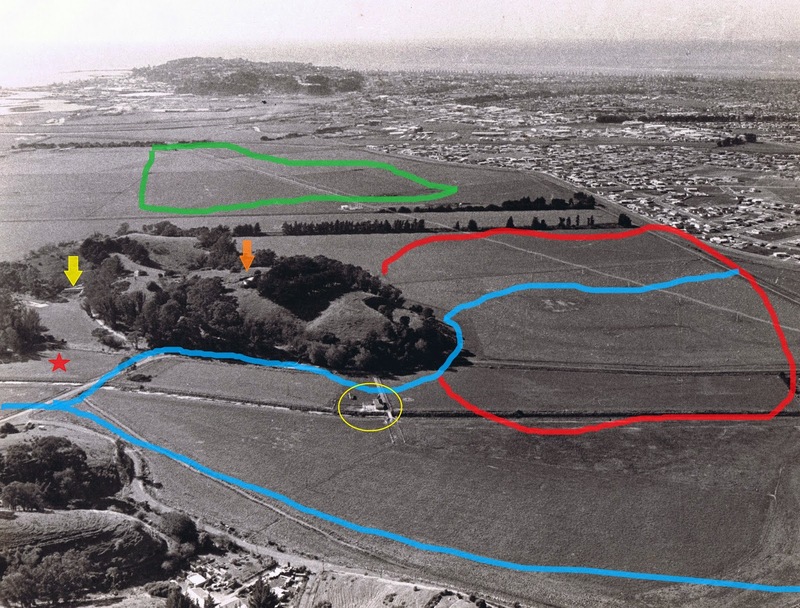 This might seem strange to those that don’t know the area but in fact was a natural move as the two older Napier cemeteries, Park Island & Wharerangi are on small hills of their own, right beside our farm hill. I grew up with these older cemeteries as my playground. 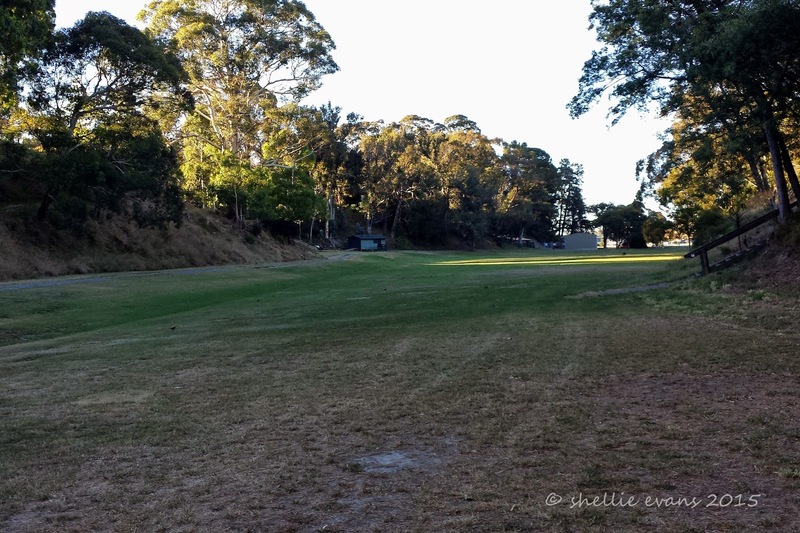 Nowadays there is a walking track that runs right around the outside of ‘our hill’ and the old Park Island Cemetery. It does feel strange walking the track as the memories come flooding back. I parked in the sports field carpark and climbed up the stairs to the start of the track, this is looking over the fields towards Tamatea. This was the Harbour Board farm once and we used to raid the pea crops that grew along our farm boundary which ran on the edge of the dip below. I still hate raw peas, I ate too many once and was sick. This old aerial shot of Park Island (c1978) shows how the city was slowly encroaching on the farms. Our farm was the hill and the land in the foreground and the bottom section of the red square. Sports fields and buildings are now well established inside the red area. The green area has only recently turned into residential and is part of Tamatea. The top blue line is now the road into the sports fields and access to the cemeteries. The bottom blue road is now a main arterial route from Taradale into Napier or heading north past the airport. The orange arrow is our house, the yellow the pigsty; the red star the horse paddock and the cowshed is circled in yellow. This photo is looking towards Taradale, with Sugar Loaf and the Mission Vineyard at the rear right. 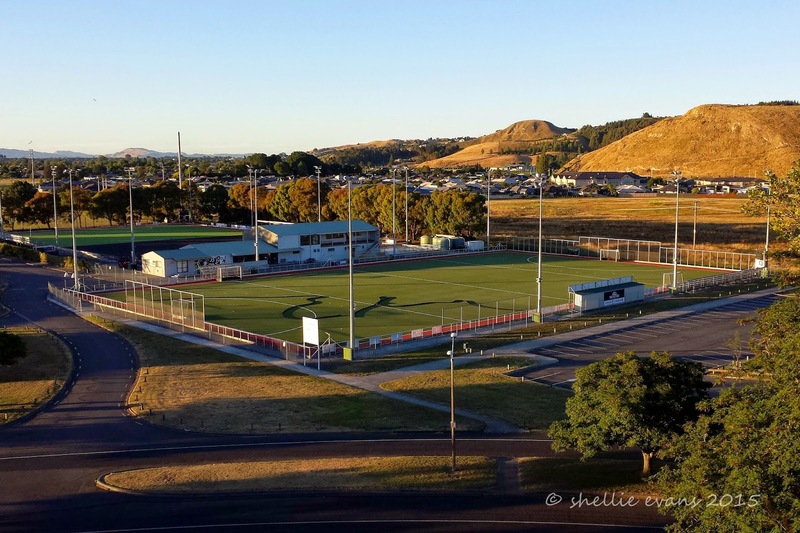 This sports complex is on our old farm land and has been built across the old Park Island Road. The cowshed is just off to the right. Well it would be if it was still there. It has only just recently been demolished. Along the track are quite a number of old fruit trees, plums in particular. 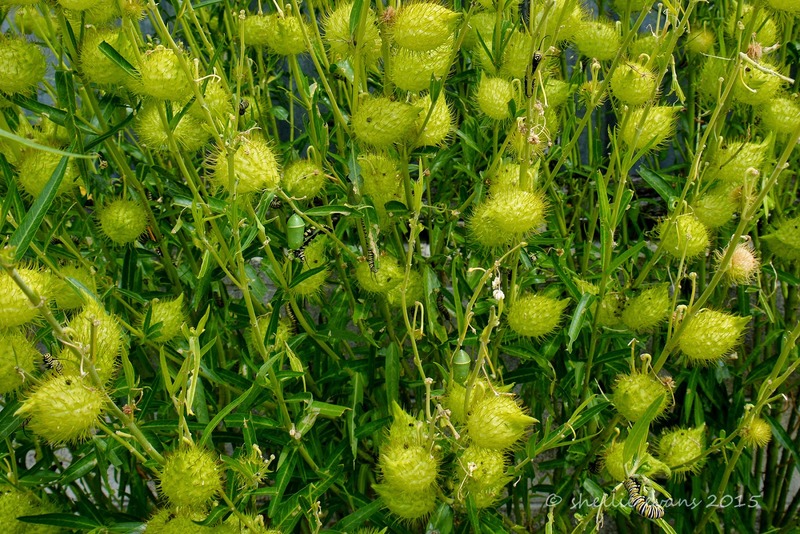 Nowadays they’re not very tasty but along time ago they tasted just fine to a child’s palate and they also provided a fair amount of pocket money for an entrepreneurial farming family with four kids. We had a novel way of collecting them too if we couldn’t reach the branches- some trees hung over steep banks. Dad would park the Bedford truck under the tree and Mum would lay out some foam squabs across the flatbed to cushion the fall, then someone would climb the tree and shake the hell out of it. Problem solved and more than enough bags of plums to sell. 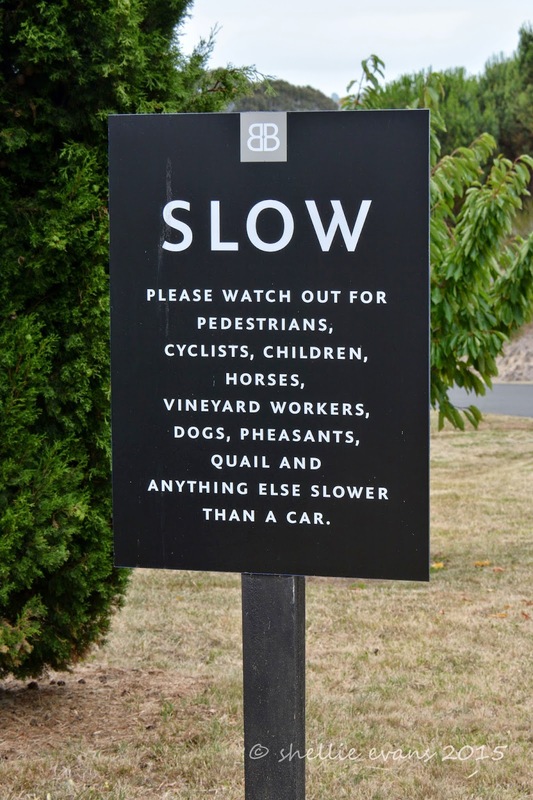 Back in those days, Sunday was the day the city folk went for a ‘Sunday Drive’ to the countryside or paid a visit to the gravesite of their loved ones. And of course who should be sitting at the bottom of the hill beside the only road that lead into the cemeteries? Yep, us kids! We’d be seated on makeshift chairs behind a table, under a sun umbrella with hand painted signs loudly proclaiming we had bags of plums and bunches of flowers for sale. We used to make a fair amount of money too; who doesn’t need fresh flowers for the grave and sweet plums to eat on the way home? Some of you may remember this post from awhile ago, Living Memory about a photo I took of Mum holding a photo of a photo of the farm. It explains quite a bit about what was on this farm before the 1931 earthquake and the reason why there were hundreds of fruit trees scattered around the farm; they were left over from an Old Peoples' Home & orchard that came down in the ‘quake. This plateau which now contains the gravesites of many, once had an old barn in the centre- the one shown in that Living Memory post. The track I’m on runs around the gully on the right, the old pear trees and a few plums are still growing there. I divert off the track for a short distance, climb over the fence and walk up to where the road now sweeps around and up to our old house. The headstones are slowly working their way up to this level. This was the turn around area for the farm vehicles and a large shed was off to the right. That’s me on the right, a friend in the middle and my sister on the left. The house veranda played a very important role in our lives; it was a play room, a gathering area, a lookout over the farm and one end eventually became Mum’s pottery display area & shop. If only this veranda could talk, it could tell some stories; a lot of parties were held here, this is my fifth birthday party; I’m third from the left. Mum is at the head of the table. 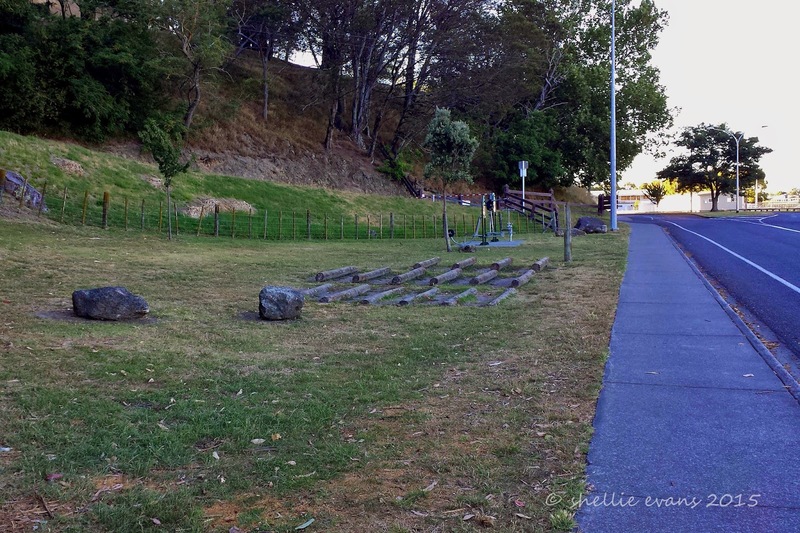 I carried on along the track and eventually a staircase takes me back to ground level again and then the path runs behind the hill, I pass by the back of the pigsty paddock and cross over behind the old Park Island Cemetery. 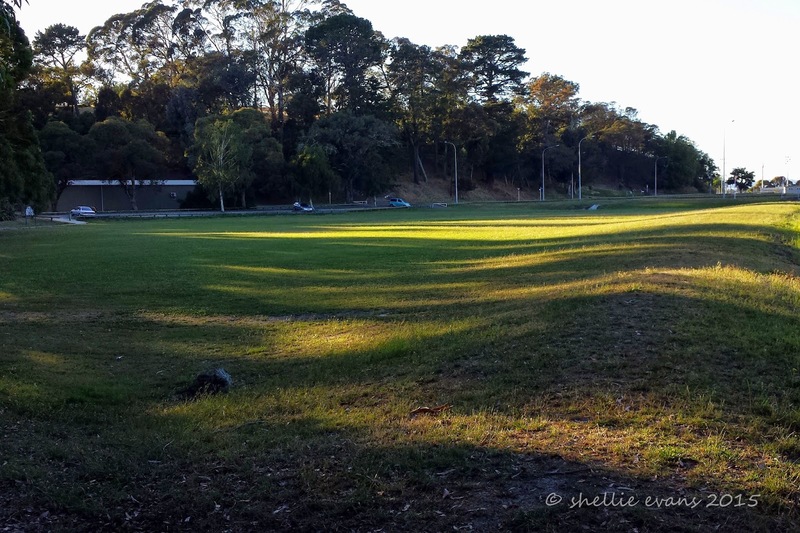 The track hugs the hill and runs along side our old eeling creek. On the other side of the creek was the paddock where we hosted the Poriate Pony Club every weekend. 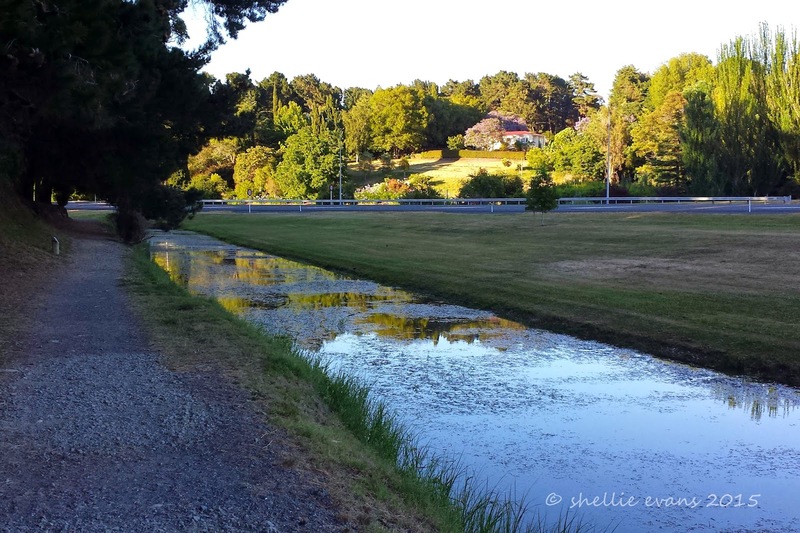 Nowadays a ruddy great expressway runs through the middle of it along with one of Hawkes Bay's many cycle trails. 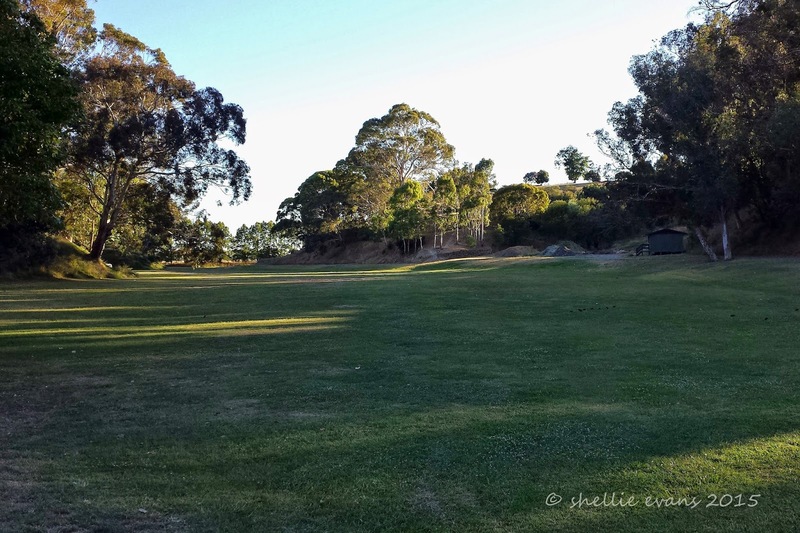 Round the next bend is our old horse paddock, many happy hours were spent riding and schooling our horses in here. Another barn was located where that shed is and the road into the pigsty ran past the front of it. There’s now a few dirt piles and a shed where the pigsty used to be. I wonder if the high pitched squeals of 400 pigs at feed time can still be heard? 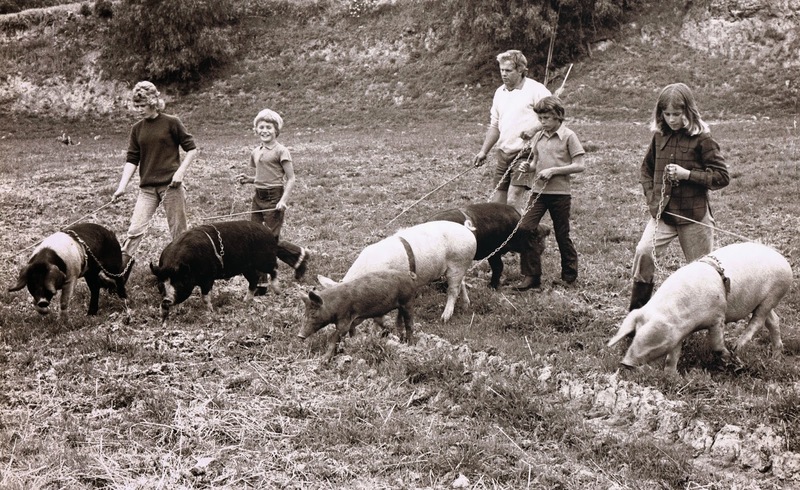 Here we are training pigs to walk on a lead; Dad was in charge of organizing the Pig Expo at the HB A&P Show one year (this looks about 1974) He had the bright idea of training a pig from each of the main breeds to walk on a lead so they could be walked around the oval in the Grand Parade at the end of the show. Pigs actually train well and we had a lot of fun walking them around the farm and down the local roads in the lead up to the show. Fortunately, one pig, Peanut who was smaller than the others just followed along. Unfortunately, come the parade she got a bit scared and took off in amongst the riders & horses in the centre of the oval. You do know that most horses don’t like pigs don’t you? Needless to say that was the first and last time pigs were invited to participate in the Grand Parade. 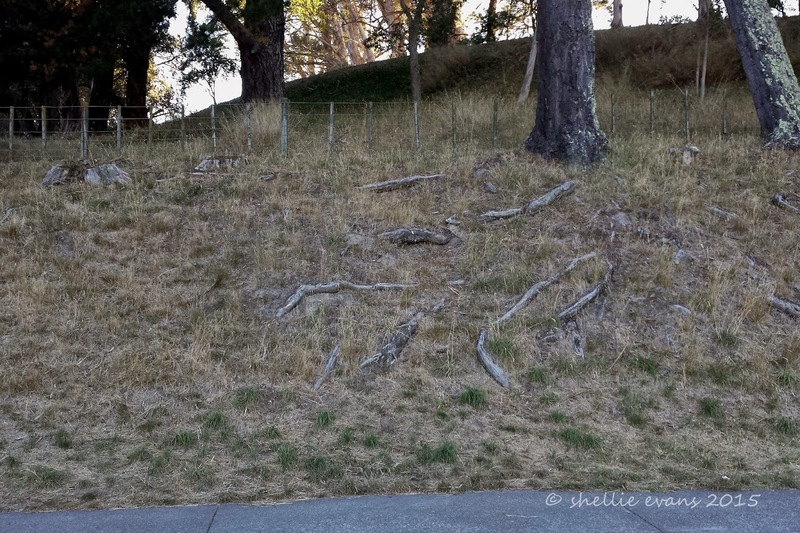 Some may wonder why there’s a photo of tree roots and a bank below. This was, and I can still see it slightly; weaving through the roots that provided natural steps, our track to the drive & house from this side of the hill. This track was our lifeline as well as our nemesis, it was a short cut to the road and the mile long walk to the bus stop each school day. In the morning it was fun, skipping and running we’d slip and slide down the track full of energy but after a full day at school, a long ride home in the school bus and then a exhausting and slow walk home we’d be confronted with the steep track. Many school bags, jerseys & feet were dragged up this slope. It is here, in this little cove tucked into the side of the hill on the side of the road, where there are now a selection of fitness activities for passing walkers & runners to complete, this is where we used to have our fruit & flower stall. And this was our drive to the house, which now looks a lot different to the narrow gravel track that we used to travel up. One day I’ll return home. To view the map, use your mouse wheel to scroll in and out or the + - box at bottom right. 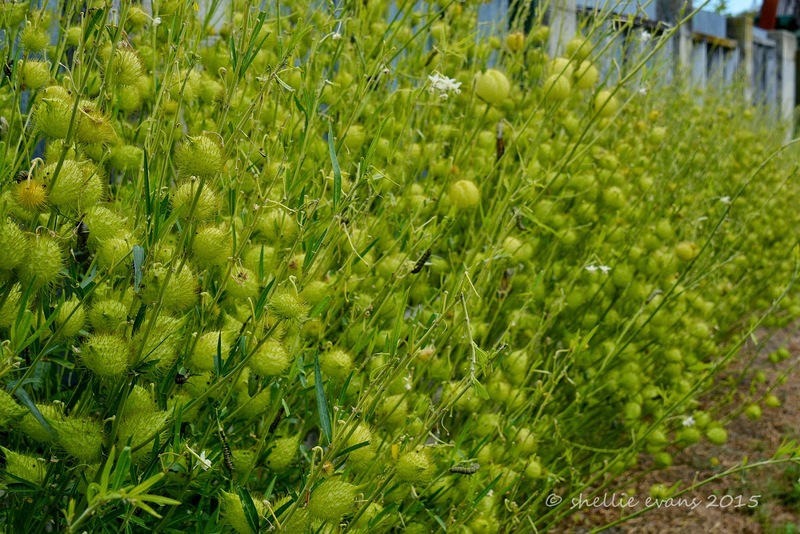 Planted along the rear fence of a property that backs onto a walkway nearby is a thick row of Swan plants (a species of milkweed) and the favourite food of the Monarch butterfly caterpillar (larvae). 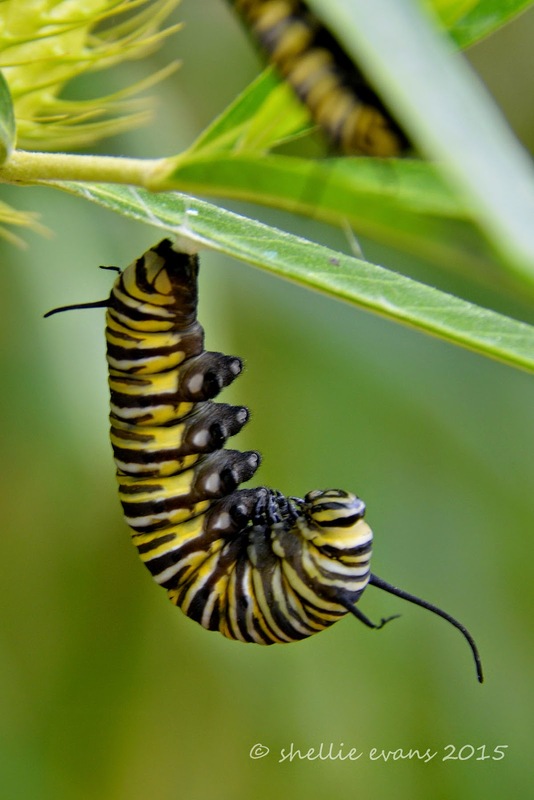 Unfortunately for the late runners in the caterpillar to chrysalis race, they have very nearly run out of leaves to eat as the plants are virtually all ‘swans’- the hairy seed pod that resembles a swan. 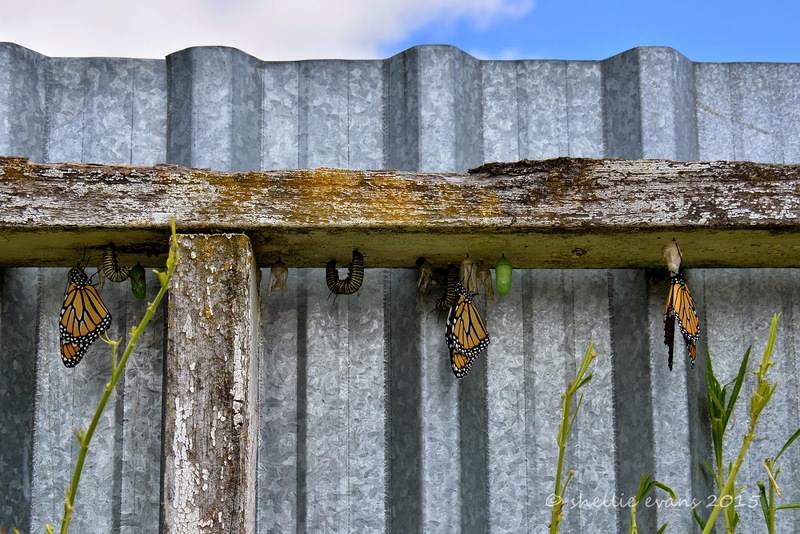 It was a hive of activity along the back fence, from the hoards of hungry caterpillars…. 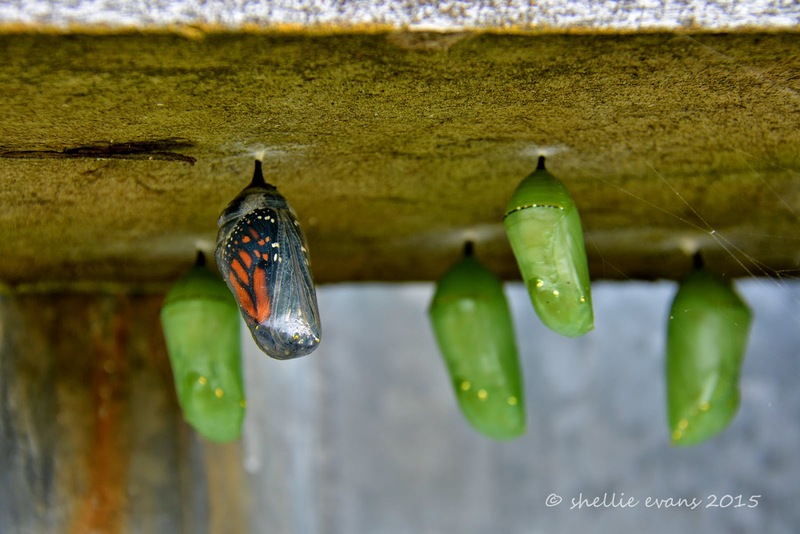 …to the ones that knew it was time to hang upside down & prepare for an amazing transformation. 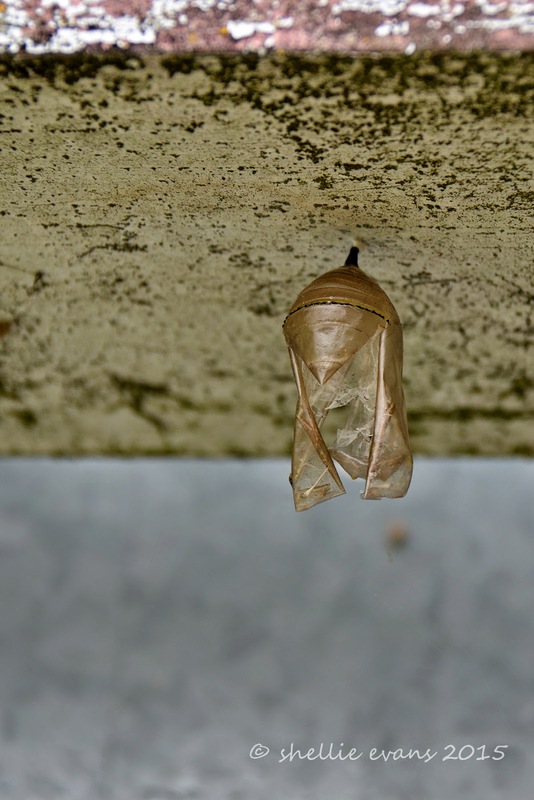 While some hung patiently waiting for that special day…. 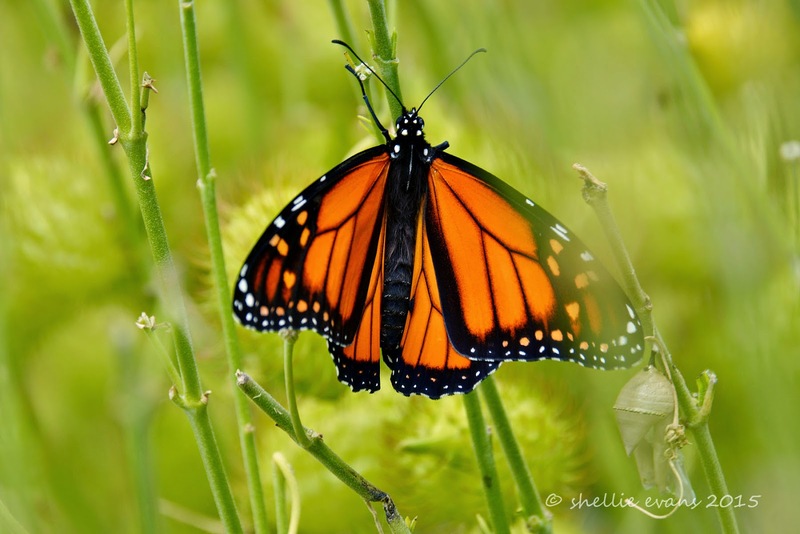 …the summer heat had encouraged others to break free. 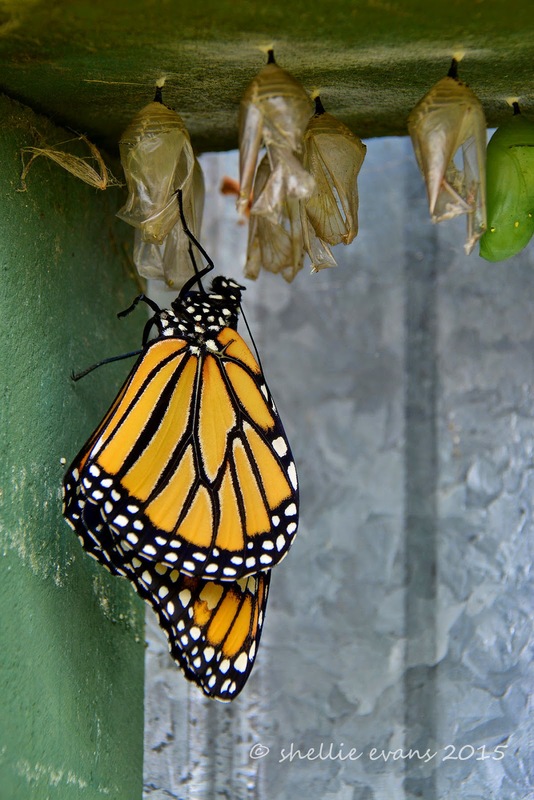 Luckily this butterfly’s neighbours had already emerged otherwise their wet wings may have tangled. A few held back, building up strength…. 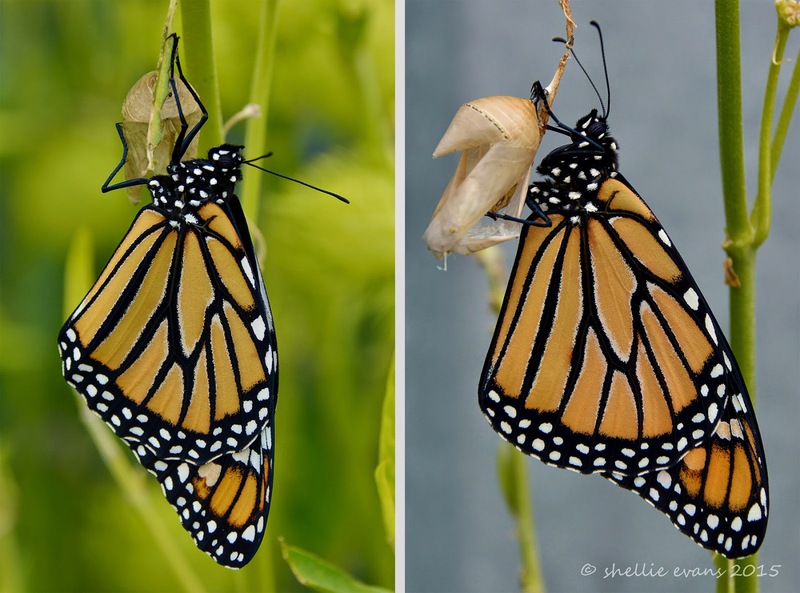 It was amazing how quickly the butterflies emerged when the chrysalis was at the stage of showing the wing pattern, just seconds and they were out. 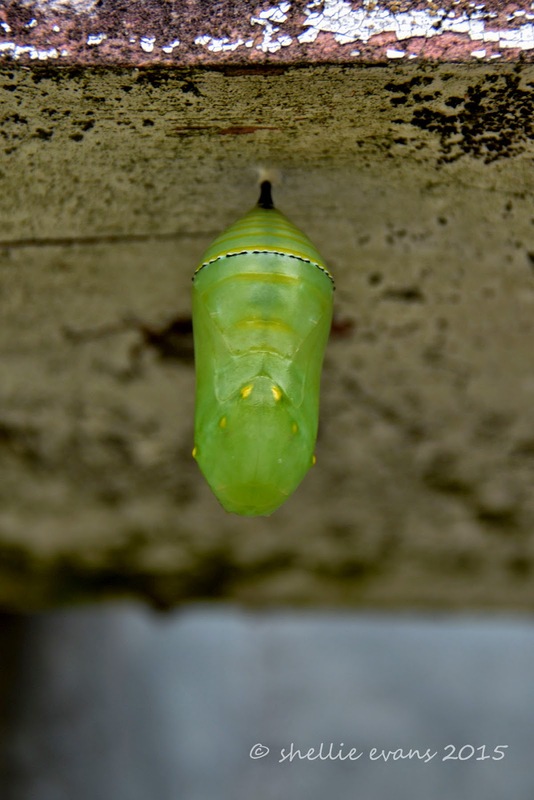 I rescued a chrysalis that was just about to hatch, a caterpillar had eaten the stem and it was in danger of dropping to the ground. I was going to bring it home but by the time I had walked to the end of the row it had cracked the case and was crawling out. I hung it behind some pods out of the wind. Unfortunately for others the wind was too strong and they had fallen to the ground where their wings had stayed compressed. Mum & I also moved some of the caterpillars off the bare plants and onto the ones that still had a few leaves left- to join a few hundred other caterpillars. 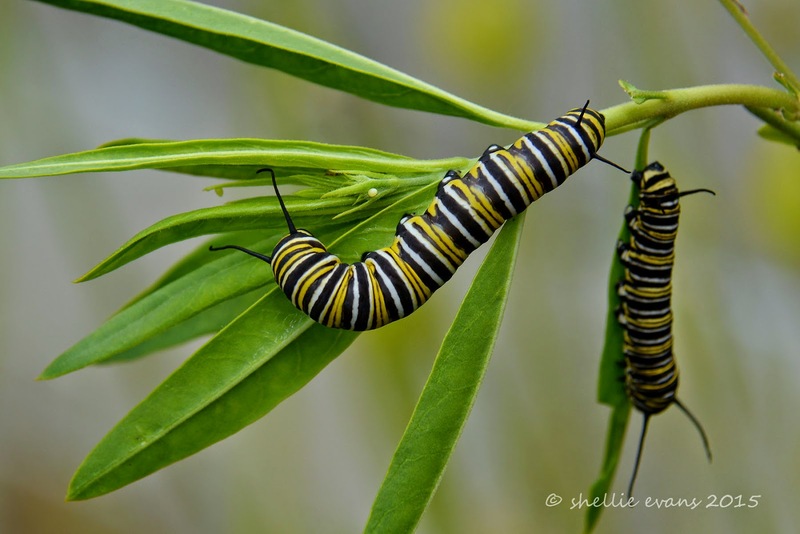 At least they would have a fighting chance but we also noticed that some of the smaller caterpillars were obviously adapting to the food shortage and were already hanging upside down waiting to turn. Nature sure is an amazing thing. 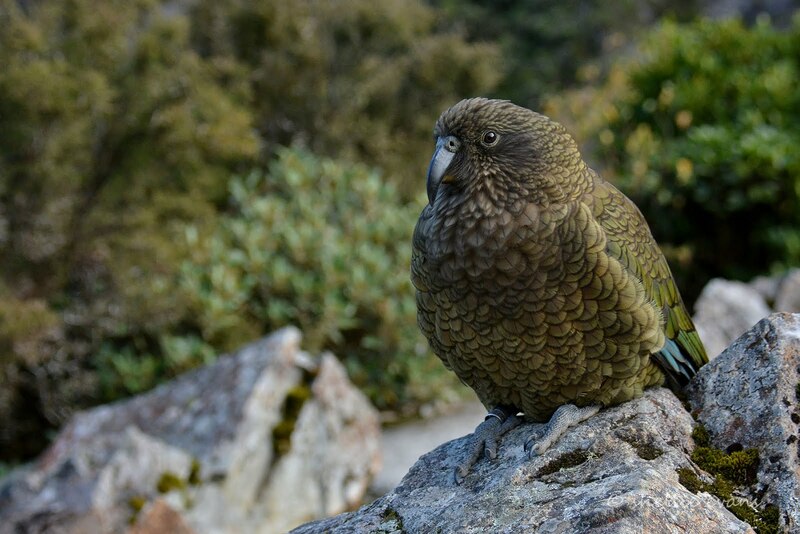 I am not the only one that has relatives in Hawkes Bay. 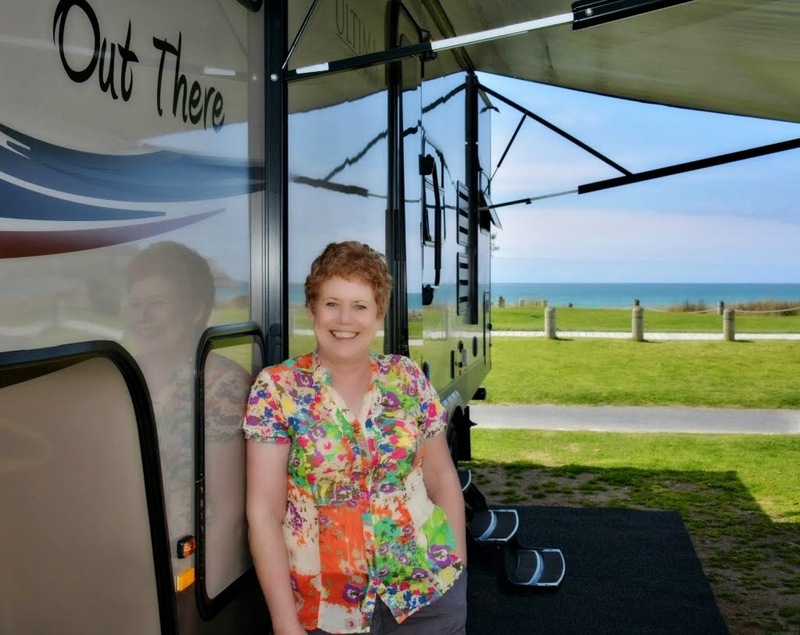 David’s brother Tony, sister-in-law Nancy & nephew Ethan also live in the Bay, although they are relative newcomers, arriving five or so years ago after purchasing the Village Motel in Havelock North. Their days are busy and full-on especially at this time of the year when accommodation is at a premium with the many visitors and tourists to the district. 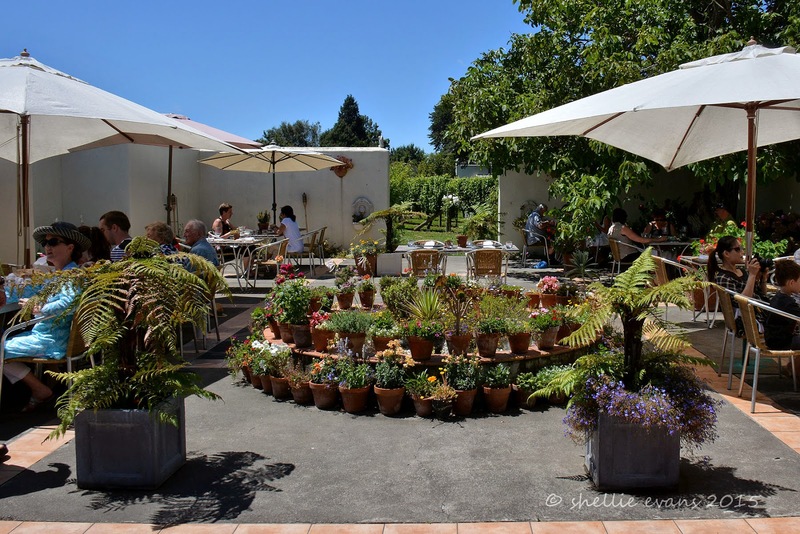 They managed to grab a few hours away from the motel on Sunday afternoon and we met at their favourite restaurant Ten Twenty Four at, well, 1024 Pakowhai Road, Hastings for lunch. 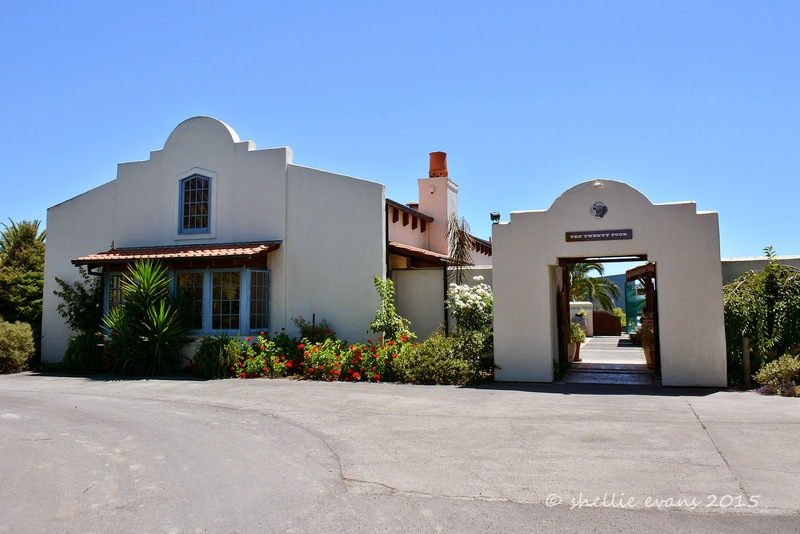 I believe this used to be the restaurant area for the Hettinga Estate Vineyard but I think the vineyard has now leased the kitchen, dining rooms & courtyard to the owners of Ten Twenty Four. The dining area, bar and open kitchen are light and airy, I love the chandeliers but I’m not so sure on the stag’s head. 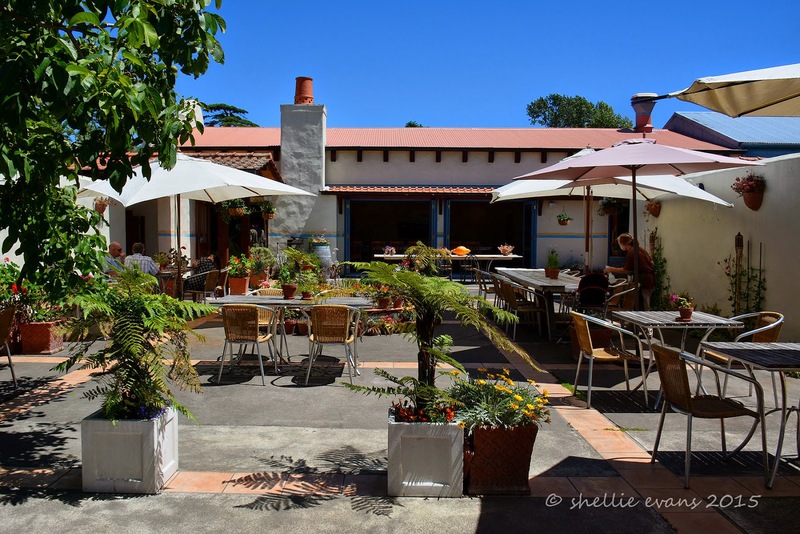 But the pièce de résistance, in my opinion, is the courtyard, and especially on yet another hot Hawkes Bay summer afternoon. Ten Twenty Four would make a lovely wedding venue, the bride & groom could get married at the end of the courtyard with the vines as a backdrop. 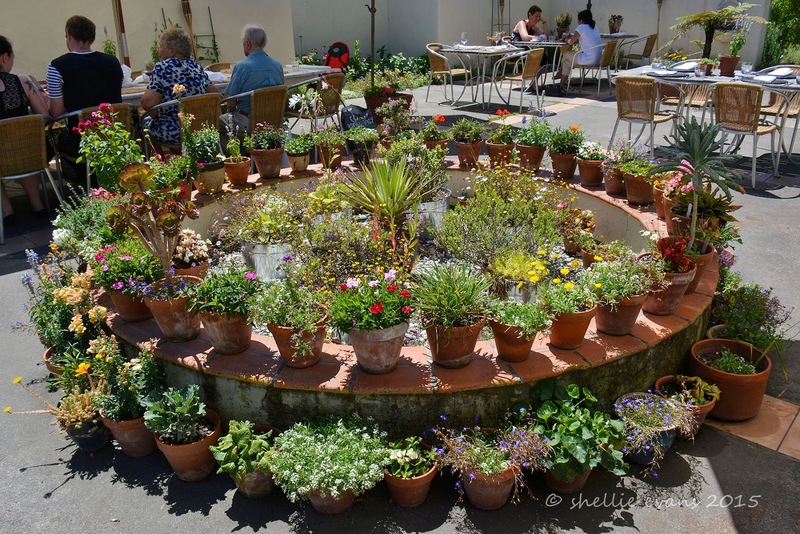 I thought this was a great way to make a feature of the old fountain pool in the centre of the courtyard. And if a wedding was taking place perhaps they could resurrect the fountain to flow champagne…….or maybe make a chocolate fountain! Tony recommended we have the Chef’s Choice for lunch and even though it wasn't on this particular day’s menu (which is printed and changed daily), the chef was happy to oblige. Small but visually appealing portions are the norm here, we love this style of casual fine dining where you leave the table replete but not feeling over stuffed. I’m afraid I can’t give you a blow by blow account of what we had although each course was explained in full to us- my memory just isn’t that good. But I can give you an rough idea; the complimentary glass of plum juice had an interesting arrangement of firm bubbles and dry ice. I loved the glass and saucer set. Next was salmon, a cockle, roasted black garlic, a chicken spring roll and a flavoured foam. A lamb rack, purple carrot, potato croquette, half a baked stuffed apricot and two different sauces were our main followed by a delicious dessert of panna cotta, chocolate mousse, an edible white basket with a marinated cherry and what looked like a scoop of icecream. It actually broke in half to reveal a few tiny hidden treasures. 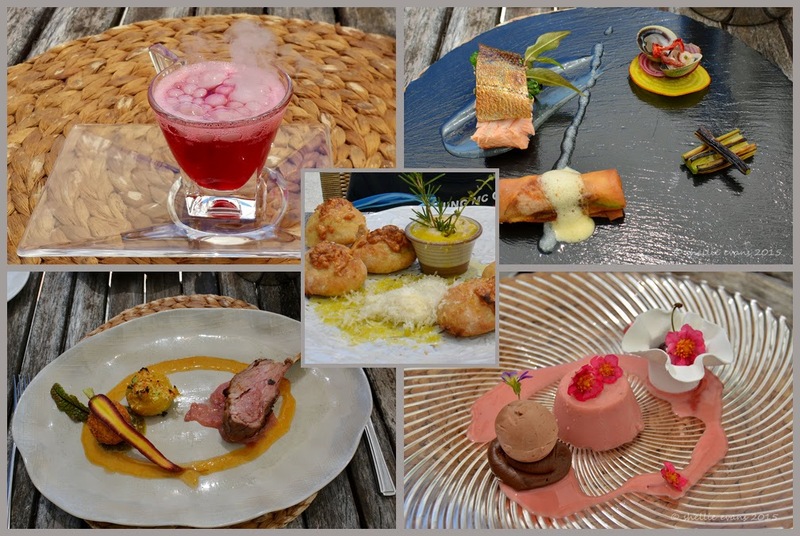 Ten Twenty Four might not be everyone’s cup of tea (or glass of plum juice, as the case may be) but if you’re looking for a completely different dining experience in a wonderful setting with great ambience then this just might be for you. But be sure to book, I hear that most evenings they are fully booked. This doesn’t surprise me as Ten Twenty Four is the number one restaurant (out of 56) for Hawkes Bay on Trip Advisor, the travelling public’s on-line ‘bible’. And just in case you’re a little worried at the size of the meals, I see from photos on TA that they are a bit more substantial for dinner. I can add some new jobs to my résumé, yesterday I was tour driver & parcel loader for Mum & five of her girlfriends (God help me!) Every month a group of ladies go ‘op shopping’, alternating between Napier & Hastings and they make a day of it. Some of the ladies, Mum included, have stalls at Napier’s Marine Parade Market every Sunday morning where they sell their crafts & wares. Op shopping gives them an opportunity of picking up reasonably priced material including beads, wool, old jewellery & clothing that they can then sell or use to make articles for their own stalls. Some of the group come along just for the outing, picking up the odd bargain for themselves too. One lady has an obsession with jigsaws and yesterday managed to find about five or six brand new 1000 piece jigsaws still wrapped in cellophane. I guess you’d want brand new, imagine getting to the end of the puzzle and finding piece number 999 & 1000 missing! 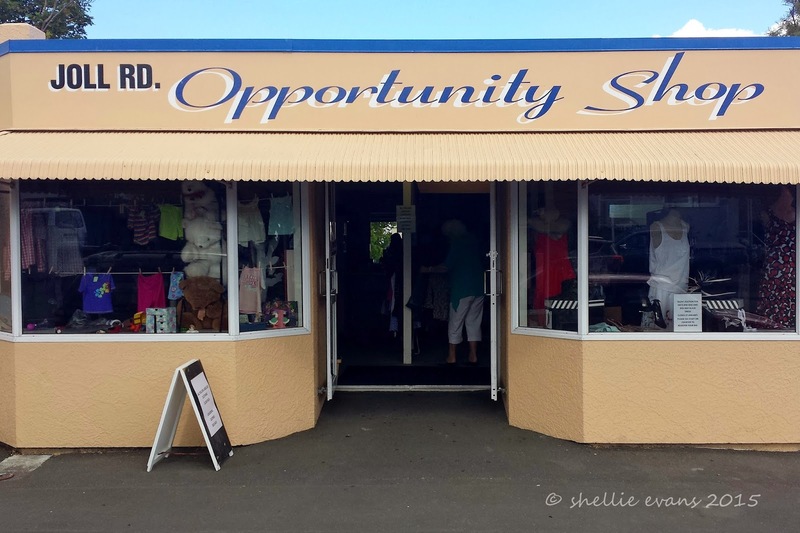 Most of the op shops we visited yesterday had 1/2 price sales on and were very busy. Half price I ask you? Half price meant a lot of things were $1-$2. Just ridiculous I say, but what a bargain for those that frequent op shops. And I suppose every little bit adds up & helps the causes. I had a laugh at the mannequin head, it reminds me of a couple Mum had in her craft shop which she used to have at Bay View. Although Mum is a much better artist than the person who drew the face on this one. I called to Mum “Look familiar?”. “Yes, except her shoe for a nose” she said. That had me giggling for awhile. I was very surprised that the ladies didn’t spend too long in each shop, they were on a mission and the trip was run with military precision, nobody lingered. When the racks and shelves had been perused they were out the door and onto the next shop. It helped that a few of the shops were near each other. 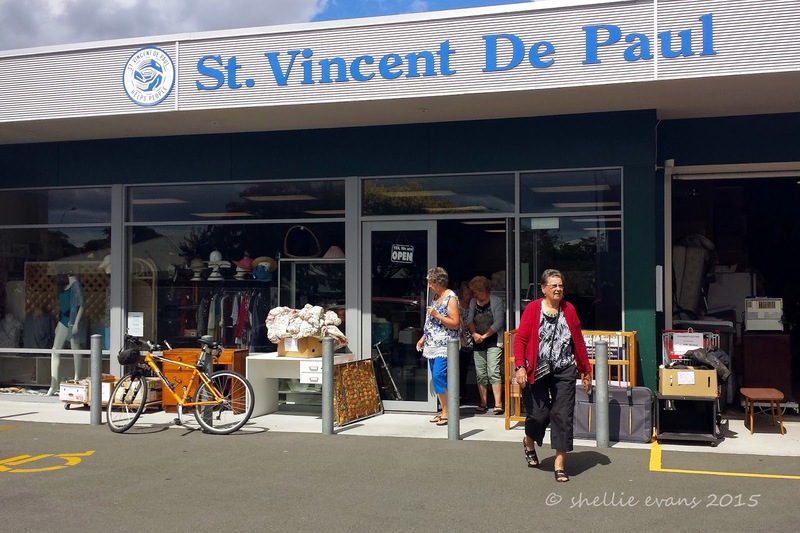 We managed to visit nine op shops plus another 3 stops along the way, travelling from Taradale to Havelock North, back to Hastings and home via Waiohiki. The most important stop (for me) was lunch. Lunch and a cool drink at, wait for it, the Hastings RSA. These ladies know value for money. The meals were large, tasty and very reasonably priced. Excuse the photo quality- it’s my camera phone and inside- I didn’t think I could haul my Nikon around all the op shops. 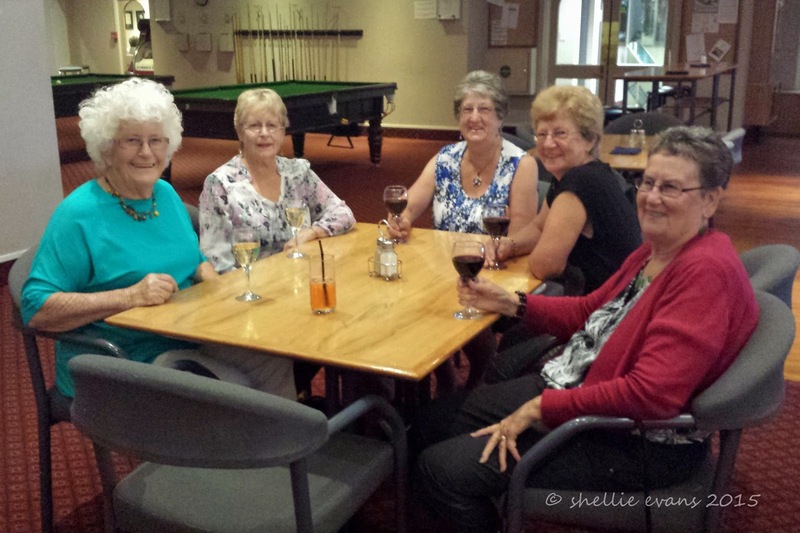 That’s Mum (Veda) on the left, then Robyn, Yvonne, Jan & Judy. You will notice that being the tour driver I was the only one on the soft stuff. 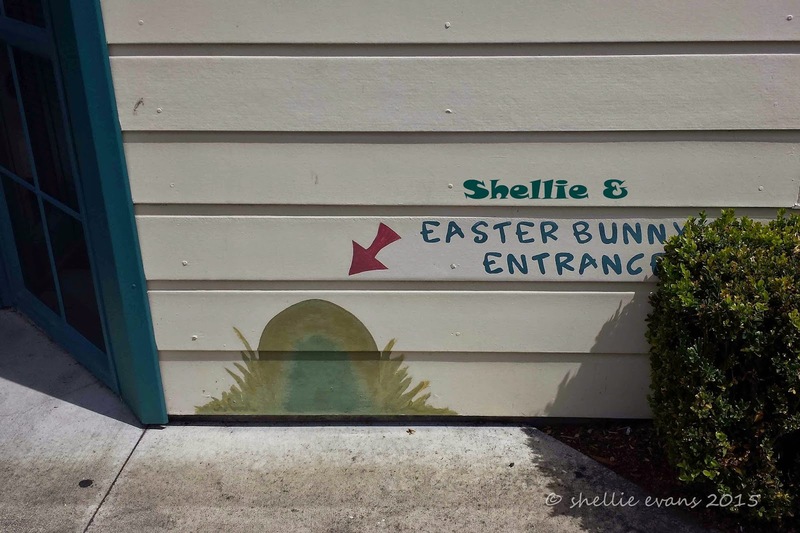 The second to last stop has us salivating as soon as we stepped through the doors followed by lots of oohhs & aahhs. 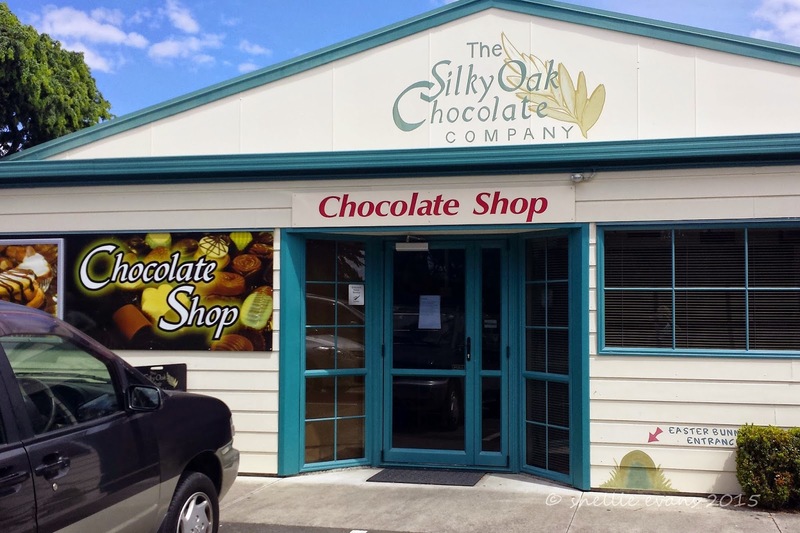 The Silky Oak Chocolate Company is located out in the countryside near Waiohiki and is a very well known tourist stop, some of the vineyard cycle trails pass by it too. There’s a cafe and chocolate museum along with the chocolate shop on site. 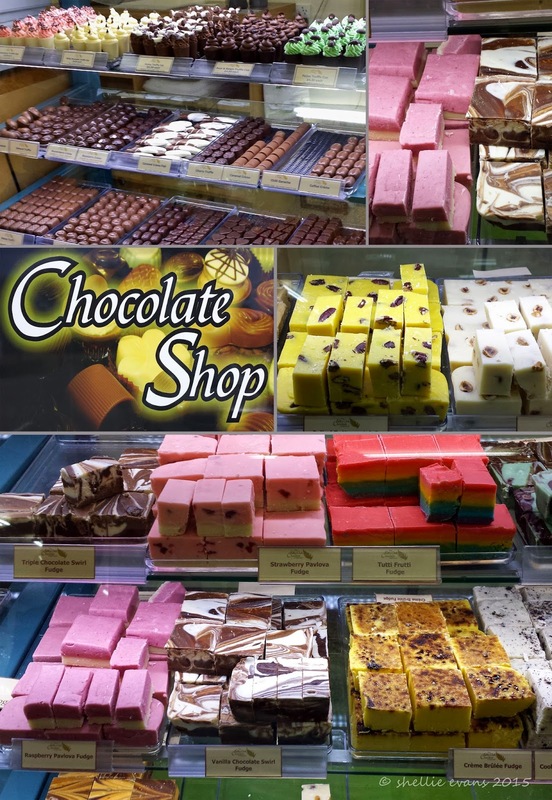 After spending most of the day visiting op shops it seemed rather obscene to spend $4-5 on a small piece of fudge or a fancy truffle or $2-3 for a piece of chocolate but……just look at that display! How could I not buy a couple of treats to sample later? All in the name of research of course. I really wanted to scoff the lot or at least sample one of each. There’s no way on earth that I could have a job here, the temptation would just be too much. 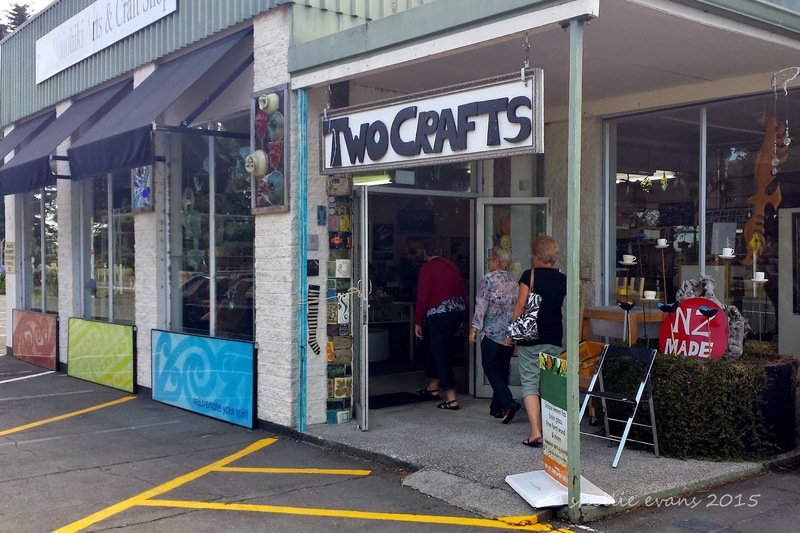 Last stop was just around the corner at the Waiohiki Arts & Craft shop located in an old dairy factory. This shop has an amazing array of arts and crafts, many based on Maori culture, both modern and traditional. Then is was home to unload the passengers & the rear of the van, which was by then filled to the brim. A quick sort & de-brief and then it was inside for a welcome glass of wine and chat (as if they hadn’t already chatted enough) before they all headed off to their respective homes where, if our house was anything to go by, the men had a very light dinner! Job done. Until next month when Mum will be back in the drivers seat. The plans are already underway with a few new stops on the itinerary. Black Barn Vineyard in Havelock North has fingers in many pies, not only does it have a well known and well regarded boutique winery, it has 16 luxury retreats & lodges for rental (located in amongst the vines and around Havelock North), a bistro restaurant in the vineyard, The Kitchen for pantry supplies, a wedding venue and function rooms, an amphitheater perfect for outdoor concerts and probably the most well known of all, Hawkes Bay’s original ‘farmer’s market’; Black Barn Growers Market which was started over 15 years ago well before farmers markets were trendy. 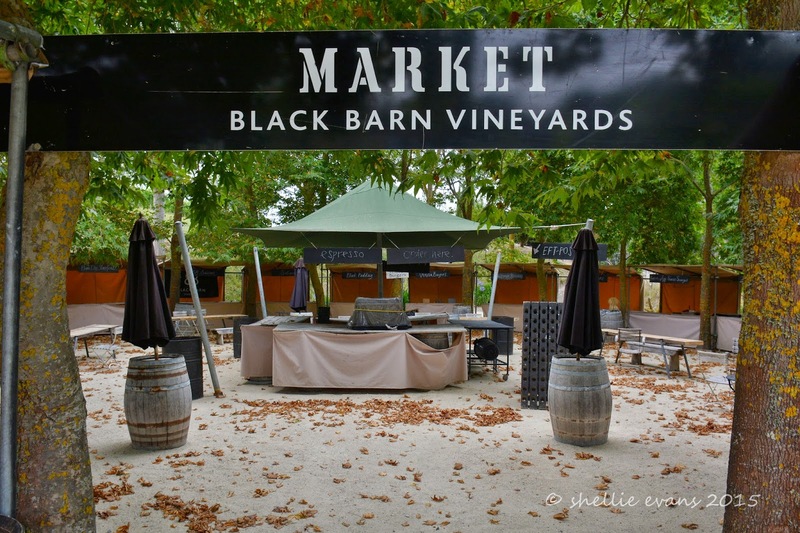 Mum & I paid our second visit to the market in a week, we happened to be in the area on other business earlier in the week and decided to check it out before returning on Saturday morning when it is open during summer from 9am until noon. The market looked like it hadn't been used in a long while, the floor was covered in fallen leaves but it has been running every Saturday since the beginning of December. The trees obviously drop a lot of leaves daily, I wonder who gets the job of sweeping them up before each market. 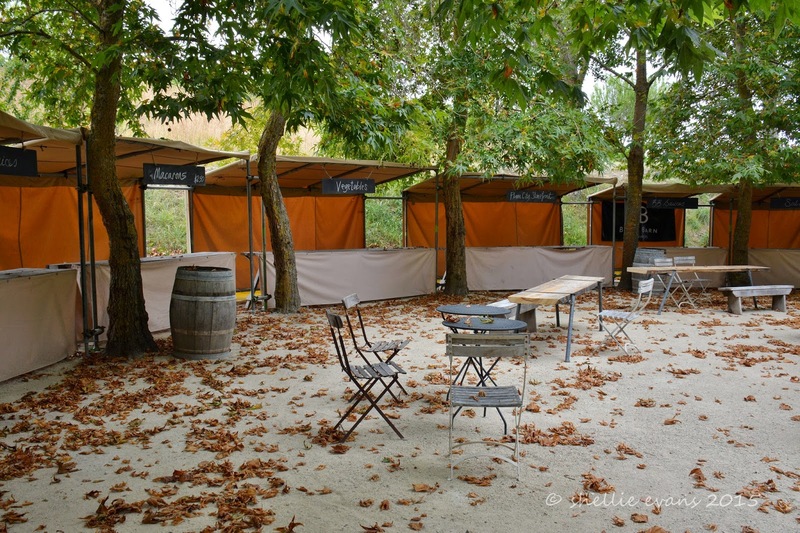 I’d love to visit during the autumn when both the plane trees and the surrounding vines would be a golden yellow. 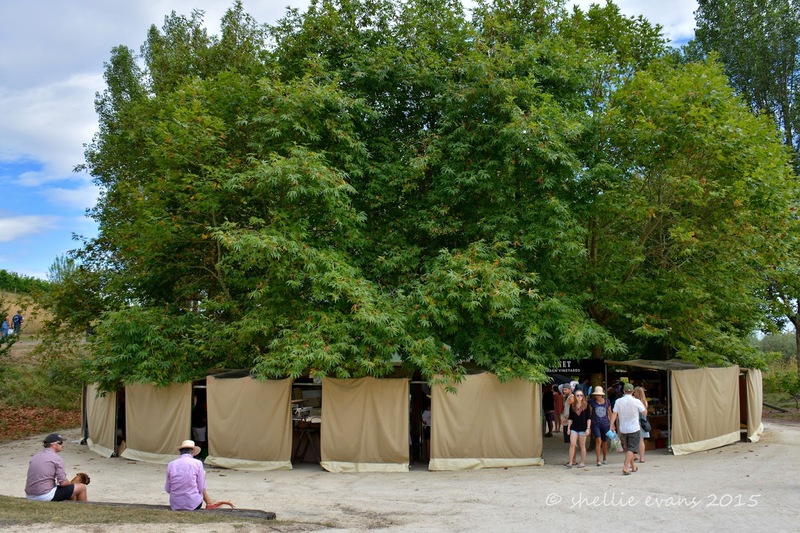 The canvas covered market is located under a ring of Plane trees in the heart of the vineyard. 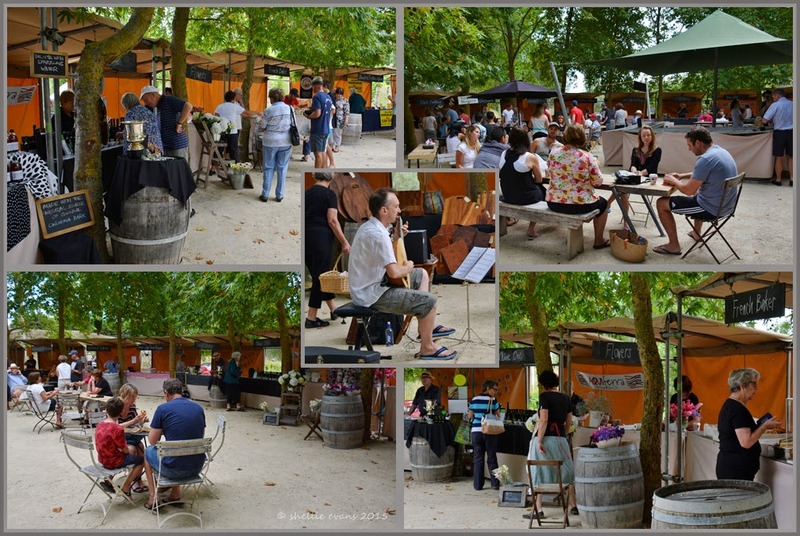 It’s a small and intimate market similar to some of the French markets that I’ve been to. 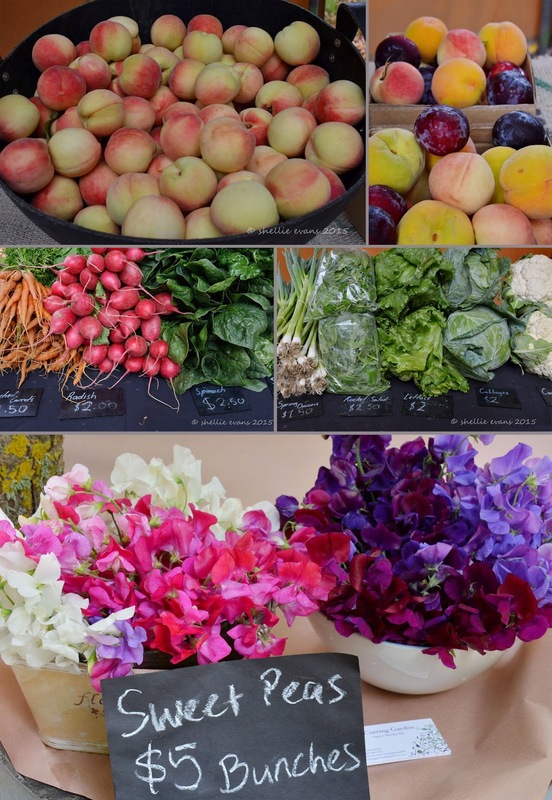 Just enough stalls with fresh good quality seasonal produce along with fresh baked breads, locally roasted coffee, flowers, meat, pickles, olive oil, cheeses, lavender products etc. We arrived early, bought ourselves a coffee, found a seat and people watched for awhile as others began to trickle in. 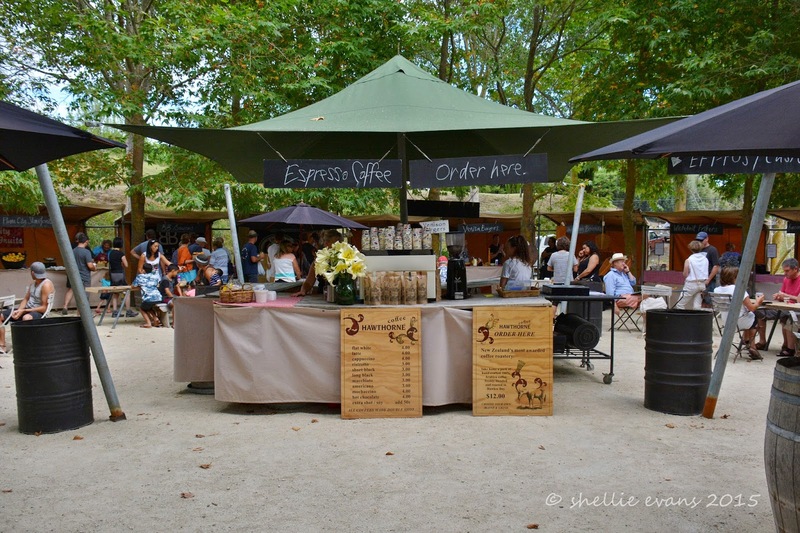 Most of the early visitors did the same, the coffee stall was doing a busy trade and seemed to be about the only one selling product for the first 30 minutes or so. After coffee we walked the circuit twice; the first time to sample a little of this and a bit of that & to chat to the stall holders, the second time to purchase. I bought a selection of fruit; deep red plums, white flesh peaches and our old favourite, the Golden Queen peach. We both managed to talk ourselves into some wild venison salami and chorizo and Mum got some lovely cheese along with a few vegetables. 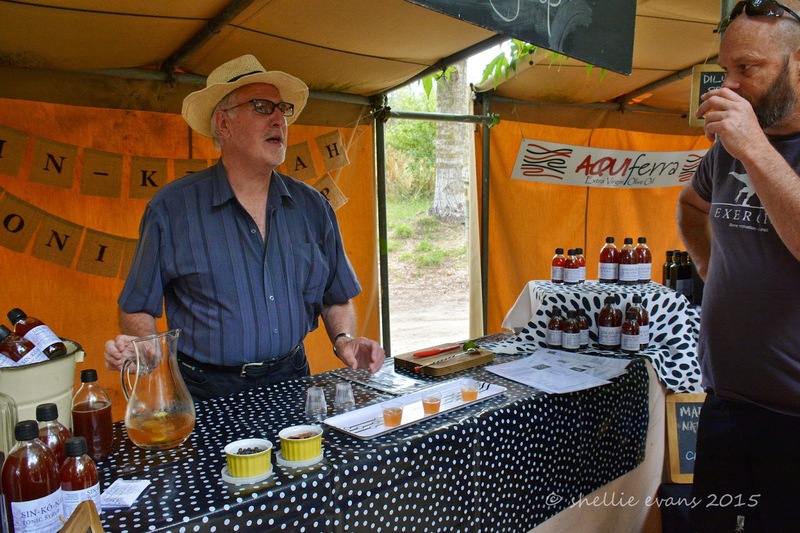 And I also thought I might like to try a bottle of pretty expensive tonic syrup, Sin-Ko-Nah, the real McCoy- no Schweppes for me. Cinchona bark is the natural source of quinine. Yes, I’ll try it with gin but I really thought it might make a refreshing drink (mixed with iced water) to have when you’re not having a drink. The jury is still out. 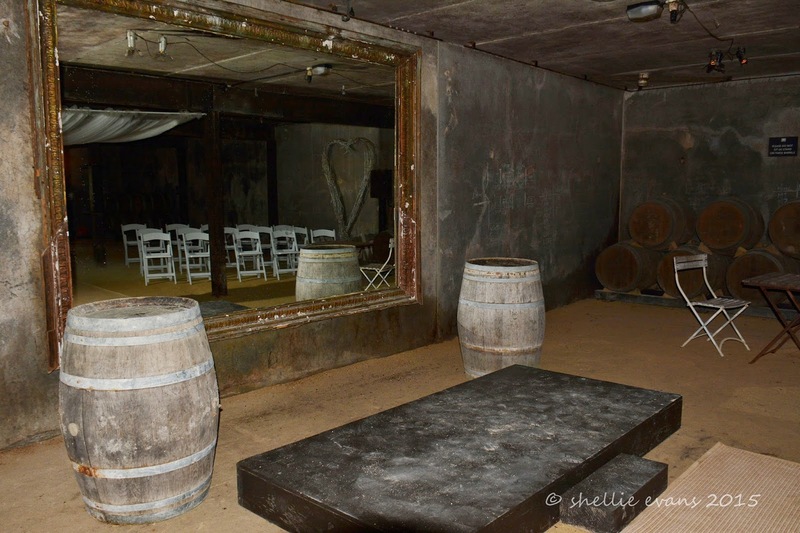 Across from the market, this underground cellar was open for inspection. Small concerts are held in here during winter with braziers for warmth and looking at the setup I think a few weddings have taken place in here too. Two large hearts made from vine trimmings hung on opposite walls- you can see one in the mirror.